FOV X-Tend Ceramic Flap Discs - Faster Metal Grinding, Millscale Removal. Applications: Ceramic flap discs can be used in place of standard zirconium flap discs to give a vastly extended life as well as faster grinding performance. Tests have shown that typically ceramic might give 3-4 time more life as well as an increase in cut rate of around 30-50% on stainless steel. Use coarser grades (40 or 60) for rapid grinding. Grade 80 is useful for surface improvement including the removal of millscale. The flexi-edges on these discs help reduce unwanted gouging. Product Notes: The flaps extend over the glass fibre backing to give a flexible edge which gives better surface contact on curves and shapes whilst reducing the tendency to gouge. This results in a more consistent, controlled finish. Generous flap density ensures extended life. 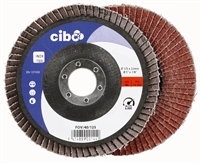 Also Available: To achieve a final finish from a tig weld in one easy step, try Rapid Combi-Discs.